How often do you need to reapply a mosquito repellent or tick repellent product to your skin? How long do different bug sprays last? It wasn't always easy to know, but EPA has now made it simple. In the past, even if you read the complete label of a skin-applied insect-repellent product, it could be difficult to know which insects would be repelled and how long the product would be effective in keeping bugs. To try to solve this problem and help people better understand product application, the U.S. Environmental Protection Agency (EPA) spent a number of years holding focus groups, conducting a survey, and working with manufacturers to make the labels of tick- and mosquito-repellent products easier to understand. The result was the development of a series of new graphics that could be used on bug-spray products. Use of the graphic is voluntary and manufacturers must apply for its use - to ensure that it accurately reflects the pests that are repelled and the length of time it is expected to work. An illustration of the pest or pests that the product repels. The name of the pest or pests the product repels. The typical length of time the product will be effective/how often to reapply it. The graphic can only be used on skin-applied insect-repellent products that are effective against mosquitoes or effective against ticks, or both. It will not be used on those that are sprayed in the air, etc. So if you see the graphic on an insect repellent, you can be sure that EPA has designated it as safe to be used on the skin (by reading and following the complete label directions). 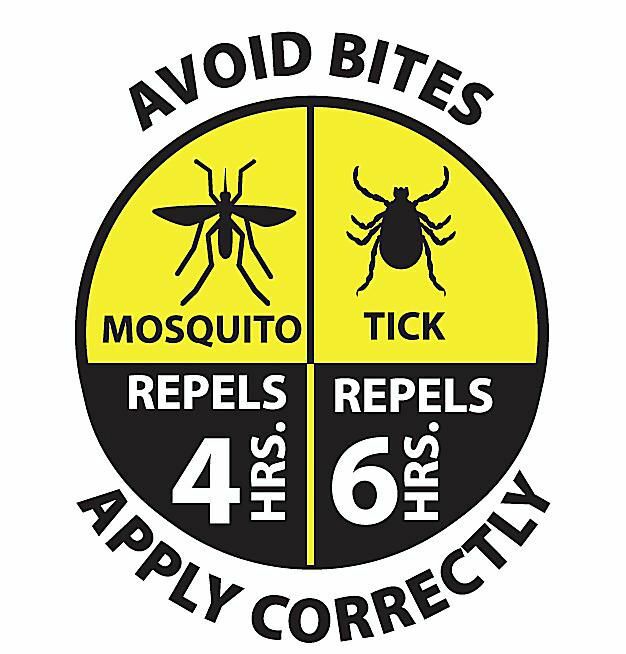 The primary benefit of the new graphic is that people will be able to better protect themselves from mosquito and tick bites and the diseases that these insects carry, such as West Nile Virus and Lyme Disease. In many ways, this is similar to the SPF listing on sunscreen product labels. Rather than trying to guess how well or how long the product will work, you can glance at the graphic and know. Having this additional, easy-to-read information prominently displayed on the label also enables people to choose the repellent product that will work best for each situation. For example, some products work longer than others, so if you are only going to be out for a few hours, you can choose a product that works for that timeframe. If you will be out all day, you can choose a longer-lasting product, and reapply as needed. Because use of the graphic is voluntary, you will not see it on all skin-applied insect-repellent products. To use the label, the manufacturing company had to provide EPA with scientific data that supports the statement it wants to put on its label about the product's repellency effectiveness and duration. This data is then evaluated by EPA to ensure it meets current testing protocols and standard evaluation processes before approval is given for its use. Thus the protection times listed on the labels are based on multiple reliable studies and had to have passed EPA review, you can have confidence that the repellency time is accurate. The graphics were approved in 2014, but due to the time needed for approvals, they were to start appearing on insect-repellent labels in 2016.